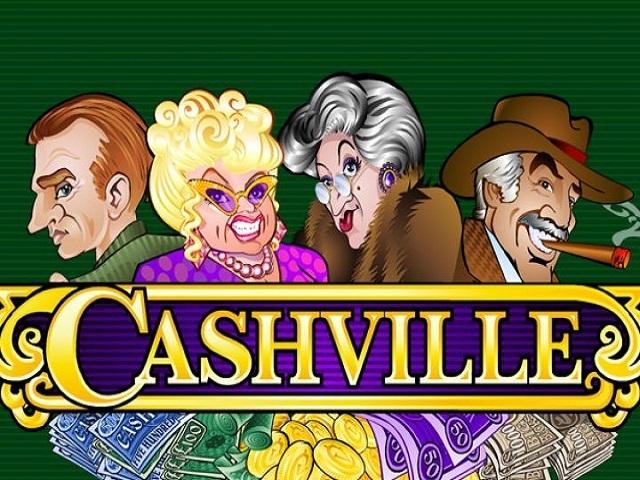 Cashville has been designed and introduced by Microgaming. This casino slot has five reels and twenty pay lines. It is accessible on well-known casinos online. The Cashvillecasinogame will take you to the fictitious town. In this town, you will be able to see things made from gold and cash. The reels are pretty big in size. There is no background of this game. It is playable in the money or free mode. It has 95.99 per cent of RTP. By using the “+/-” button, you can easily set the coin size. The coin size ranges from 0.01-20. Use “Select Coins” to adjust the number of coins for each pay line. Use “Select Lines” will assist you to adjust the number of pay lines to bet. “Bet Max” button is utilized to adjust the maximum bet accessible. “Spin” button will turn the reels. The auto-play feature is provided to those players who get tired of spinning the reels on their own. On the other hand, the “gamble” feature is present through which you can double up your win by making the right guess. Cashville by Microgaming has cool symbols. The wild symbol of this casino slot is “W” which can swap the other symbols. The scatter symbol is characterized as “S”. It can provide a scatter win. All the scatter wins will be multiplied with the total bet. The bonus feature of this casinogame is linked with the bonus symbols. When they land three or more of these bonus symbols onto the reels, then the mini-game will open up. At the time when you activate this feature, then you will need to choose the character. Every character will provide you with a unique thing to pick. Bill Bullion will provide you with the oil. Dame von Deeds is a character that will provide you with the option to pick the deed. On the other hand, Sir Sterling will put forth an option to pick the vault. Betty Boodle will offer you the opportunity to pick the picture of the dog. When the game finishes, then you will get your reward. This slot machine provides no progressive jackpots. However, the wild and scatter icons are featured in it that are linked with the big prizes. In short, it is a nice slot machine to play.